We can also help you decide whether you even need a new website, and we'll be happy to simply make updates to your current website. We'd love to hear from you. Get in touch! This farm website includes a news area, email signup, and interactive map. This farm website includes recipes, news area, email signup, and interactive contact form. This food council website includes an event calendar, news area with lots of photos, and email signup. This small sustainable farm website includes a news area for weekly updates, an email signup form, lots of photos, and seasonal order forms for pre-order items like turkey. This food council website includes a directory of local farms and other local food options, plus an event calendar, online donation area, and a blog. This small u-pick farm wanted a simple website — just the basics so that searchers can discover their farm in Google and easily find seasonal updates, hours, and directions. This bakery website includes a photo gallery of custom cakes, contact form, news section, and event calendar. 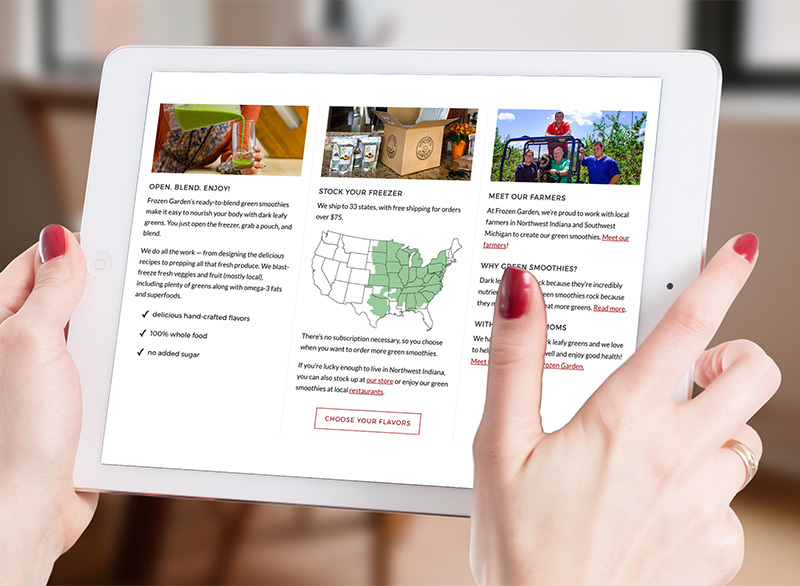 This food network website includes a contact form and email signup, with additional website components planned for the coming years as the organization grows. This small farm website is designed to make it easy for customers to find them in Google and learn about the farm background. We also designed this farm logo. We publish articles and photos from the print magazine Edible Michiana to their existing website. For Frozen Garden, a food startup, we developed text and programming to create a multi-column section on their existing Shopify home page. We also developed text for several pages of their existing website.